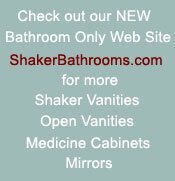 Our Shaker styled linen tower is the perfect compliment to our vanities, and very functional. The particular linen tower in the photo below is 70" high with a 19" wide by 18" deep cabinet. Each cabinet section has an adjustable shelf and the one shown below also has two 6" functional drawers. 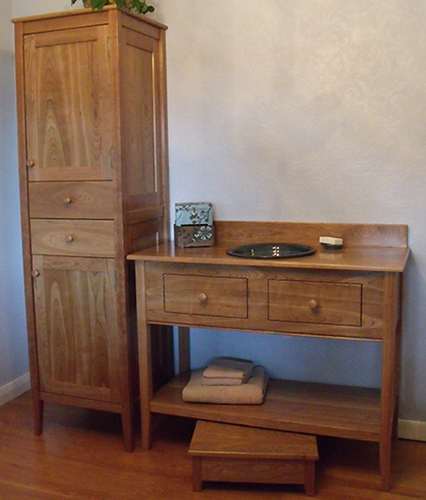 If ordered with one of our vanities we can match the height of the legs. The matching childs bathroom stool shown in the photo is 10" x 14" and made to the height you request. Comes in all our woods and finishes. Our cherry linen towers are hand rubbed with oil and then a satin finish. Our hard maple linen towers are finished only with a clear finish. Our red oak linen towers come in a traditional Golden Pecan stain. Our white oak linen towers come in 9 beautiful stains. Tapered Shaker legs; or square legs for a Country/Contemporary look. Below are only sample prices. WE MAKE ALL SIZES. When you email us your requirements we will email you back a firm quote. A 50% deposit is due at time of order with the balance due when your item is ready to ship. Some assembly required unless you make arrangements to pick it up. Shipping cost depends on location. where you live (you may be able to get our linen towers locally!) Here's Why! Our painted linen cabinets are built from Poplar and are finished in your choice of 56 Milk paint colors (shown below) or in any of 3,645 Benjamin Moore paint colors. If needed, go to the Benjamin Moore Color Gallery to help you pick out that perfect Benjamin Moore color you are looking for.